As you bite into that big, juicy apple, fresh off your tree, you catch sight of something that shouldn't be there; that veritable worm in the apple is no cute cartoon. Most likely it's the larvae of the codling moth, a serious pest of apples that also attacks pears, large-fruited hawthorns and walnuts. Introduced from Europe by early settlers more than 200 years ago, this insect pest can be a bane in the home orchard. The moth larvae tunnel into the fruit and as it feeds, pushes out brownish excrement called "frass" that accumulates around the entrance hole making the fruit unfit to eat. The point where the larva chews a short distance into the apple is called a "sting." At this point they either die, enter at another place or continue to munch their way through the apple to the core. In addition to the direct damage they cause, the fruit can subsequently be attacked by microbes that lead to fruit rot. The rarely seen adult moth sports distinctive copper-colored wing tips and are most active during nighttime hours. They first appear in mid-March to April and mate when sunset temperatures rise above 62 degrees. 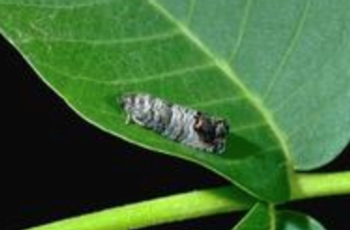 Females lay tiny eggs on fruit or leaves, and the hatching larvae immediately bore into fruit and eat until they are ready to spin a cocoon. They then seek out protected sites, often beneath bark and underneath debris around the base of the tree, and remain there until the adult moth emerges. Successful management of these insidious pests is dependent on a variety of factors, including the number, size and health of the trees, and the codling moth population. A multipronged approach might be needed to keep this pest in check beginning with good garden sanitation; rake up and destroy dropped fruit as soon as it falls, especially in May and June. Limit shelter for cocoons by removing debris around the base of the tree, and eliminate flaps of bark that may develop on older trees. Look closely at maturing fruit, and destroy apples that have stings or any telltale frass. Thinning fruit can reduce the level of damage; the female moth likes to lay eggs where two apples touch and can lay 70 to 100 eggs as she flits through your tree. After thinning, when fruit is one-half to one inch in diameter, "brown bag" it. Place a small brown paper bag over each apple, cut a slit in the bottom of the bag large enough to fit over the fruit so the stem is in the slit and the little apple is in the bag, then fold and staple the opening of the bag shut. At about 10 to 14 days before harvest, remove the bag and allow the apple to ripen. Natural enemies like spiders or carabid beetles might feed on codling moth larvae or pupae, but because of the nature of codling moth injury where a single larva can destroy a fruit, natural enemies on their own are generally not sufficient to provide acceptable control. Cyd-X, a virus that affects only the larvae of the codling moth, is a safe, biological pesticide that won't harm beneficials, bees, humans or pets. Apply it every seven days after eggs hatch for at least three or four times per generation. Spinosad is another low-toxicity pesticide that is safe for most beneficial insects as well as for people, pets, and the environment. It requires repeated applications for acceptable control. You can increase its effectiveness of both products by adding one percent horticultural oil. Effective control of these pests requires precisely timed insecticide application in order to kill the larvae just as they hatch.